If you’ve been around here for a while, then you know that summer food is all about the simple seasonal veggie side dishes. Those are my jam, but summer is also for Tacos! For real! When I think tacos- I think of summer in Vermont with my family around me. 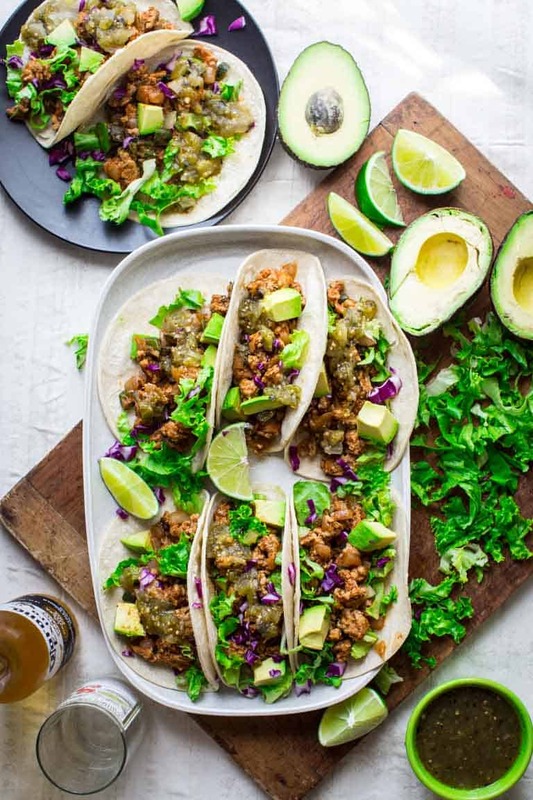 Read on to find out why that’s not as random as you think and why these 20 minute ground chicken tacos with poblanos are just what your summer table needs! My mom’s side of the family is from Texas. And they all come up here to spend time on Lake Champlain in the summer. When they’re up here- my uncles and cousins, we love to get together for taco parties. This is something we’ve been doing since I can remember. My Grandma Ginger started it. She would cook for days in preparation, which always somehow coincided with the hottest possible stretches of weather. She loved to complain that it was too hot, and too much work to do the tacos, but she secretly loved to put on these parties. And trust me, we loved her tacos! She would cook the beef in an uber retro avocado green electric skillet on four feet. It would sit right on the counter, the meat simmering in all its savory spicy glory! She would also bring really good corn tortillas to Vermont in her suitcase from Texas, and spends hours over hot oil, frying them, one by one, and bending them into shape with red handled tongs. Then with one hand setting it to the side to cool as she was using the other hand to grab another tortilla to take the plunge. 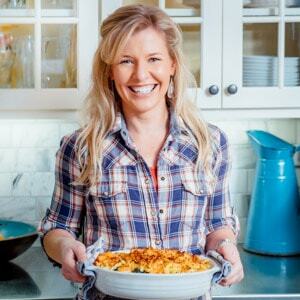 Can we all now take a moment to imagine how amazing her cottage would smell during this cooking spree. Ahhhhh! The food was always out of this world: giant boatloads of fresh guacamole with lots of lime and salt- not too much else and tortilla chips. Next would come the assembly line for building your own tacos. Then a conversation about the cheese needing to go into the shell before the meat so the hot meat would melt the cheese. This is the way it is done. Do not question. Ask me how I know. Along with Gramma’s amazing tacos, we’d also have yellow squash and cheese casserole with canned green chilis. And a favorite in our family- chili relleno bake made with more cheese. We ate ourselves silly. We still continue the tradition now, though not as fervently as we did when she was still alive. 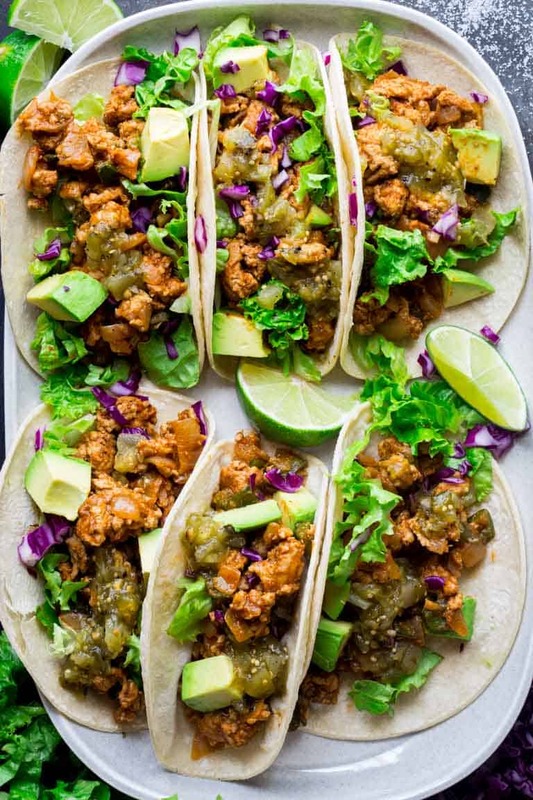 These ground chicken tacos with poblanos are so silly easy, they are a far cry from the slaving over the stove all day tacos Grandma made. These are ready in 20 minutes flat. There is not a single shred of cheese (you won’t miss it since there is soo much gosh darned flavor going on- seriously!) And the tortillas- not fried. Just fresh and soft. The texture of the chicken is so tender. Turkey works too, but if you can find ground chicken I think its even better because it is more tender. I recommend Coleman Organic. I also used diced poblano peppers to bulk up the serving size, but they add very little in the way of additional calories. Bonus- they are high in Vitamin C! 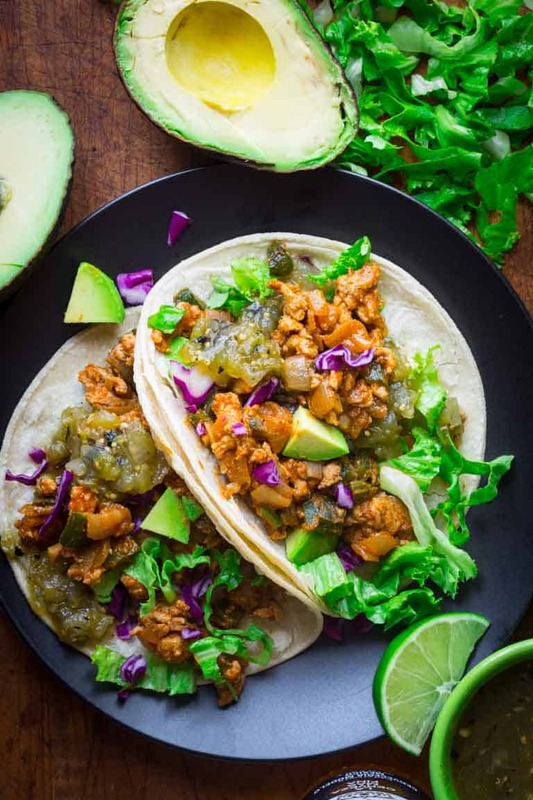 So yeah, these are not the gut busting tacos of my youth, but they are so delicious, and easy and summer wouldn’t be right without tacos! Do you have a family tradition of a specific meal like a taco party? Do you put cheese into the shell before the meat to melt it? Do you ever travel with food in your suitcase? 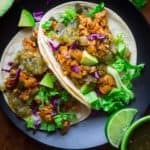 20 minute ground chicken tacos with poblanos are the perfect super simple kid friendly Summer entree! Preheat oven to 325 degrees F. Wrap tortillas in foil stacked in two packages of four. Place tortillas in hot oven to warm. Meanwhile, heat oil in a large skillet over medium-high heat. Add poblano, onion and garlic, and cook, stirring often until the vegetables are softened and beginning to brown, 5 to 8 minutes. Add chicken, and cook, breaking up into small pieces as it becomes opaque, until the chicken is completely cooked, 4 to 6 minutes. Sprinkle with chili powder, cumin, salt and chipotle, and stir to coat until fragrant, 30 to 90 seconds. Add tomato paste and water and stir until the tomato paste is dissolved into the water and it forms a sauce to coat the chicken mixture. Serve the chicken in the warm tortillas and top with desired toppings. Fab story – your Gran sounds pretty amazing and resilient. These tacos are lovely too – and slightly more manageable than several days worth of cooking. Ha ha, slightly! Thanks so much for stopping by Jane. Thanks so much Julia. Taco parties are the best! I love that you have made tacos so quick and easy. They sound delicious, and I love the pop of purple there too. Thanks Danielle. I hope you try them! Glad to hear my family is not the only one who does that. She was and I miss her. I totally agree about Tacos on days other than Tuesday- they’re too good to limit them to one day of the week. Wow, that’s awesome! Thanks so much for saying so. Have a great day Bintu. Your recipe and photos look great. Might have to break with tradition and have “Taco Thursday” tonight! What a beautiful story! And yes, my family has a special meal and it depends on season. As you said, tacos party takes place in summer in my family. Mention about travel with food in suitcase, I am a big fan of it. I always bring something, at least bread (yes, i love it) whenever I travel. I had to laugh because my Mama had an avocado green electric skillet too! The tacos sounds amazing and perfect timing since we’ve got poblanos coming in like crazy right now. Those electric skillets need to make a comeback! Love the color combinations of the ingredients in this recipe! Definitely looks delicious and awesome photos too! With all the color, nobody will miss the cheese and sour cream! 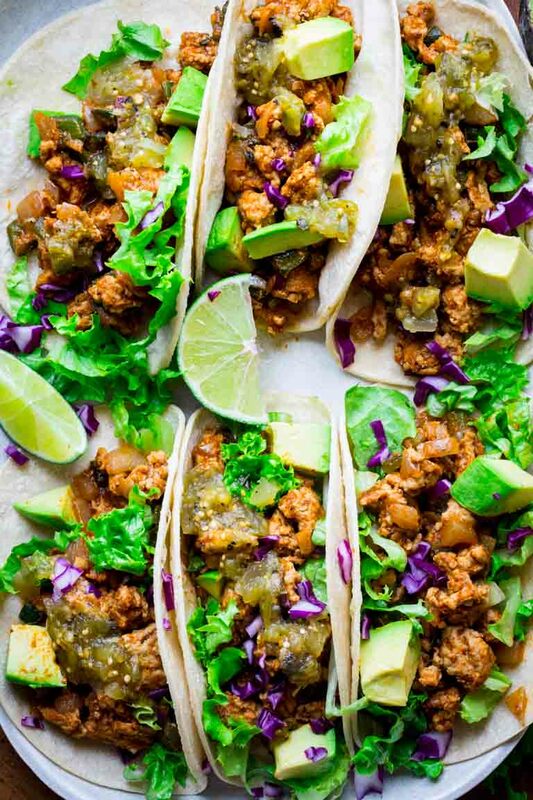 Tacos make an awesome meal option no matter what. Love how colorful your spread is. We totally agree Anvita! They are year-round favorites here. What a colorful and gorgeous dish! Who needs to go out for Mexican when you can make these at home. And avocado just makes everything better! Avocado really does make the world go round! Oh, what fun memories! that’s great that she used to bring tortillas from Texas in her suitcase! I mean, in those days you probably couldn’t find a decent tortilla in Vermont! Your tacos look so fantastic! You learned well! I think they came from a local tortilla factory in her city. It just recently shut down in the last couple years. They were out of this world! Mexican food is my go-to for weeknight meals! I can’t wait to add this to the rotation! I have to agree with you. I keep a couple different Mexican spice blends on hand, and often find myself grabbing them when I am throwing together a weeknight meal in a hurry. 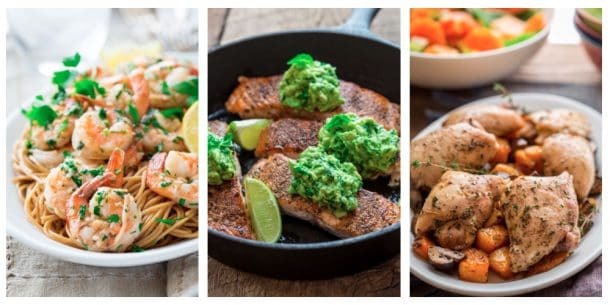 What is the green salsa on top? Did you make it? Hi Jasmine. It is Frontera brand. I like their tomatillo salsa a lot.